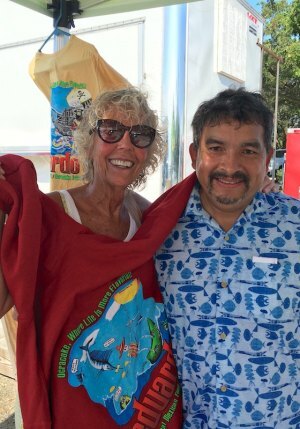 Island resident Susan Dodd came out on Sunday to show support for Eduardo and buy her Eduardo’s garb. Eduardo’s Taco Stand was required to suspend operation last week by order of the Hyde County Health Department when the temperature on the prep table (where the food is assembled) was higher than the required 41 degrees. A tour of the taco truck on Sunday, July 22nd showed the prep table temps quite chilly... indeed, some of the ingredients had frozen, but on July 17th, with temperatures in the mid-80’s and a long line of customers outside, the prep table was not able to maintain the required temperature. “We try and keep the top closed,” said Eduardo Chavez, proprietor of the popular eatery. “But the temperature on the grill is 450 to 500 degrees.” With so many orders to fill in such a short time, the grill close by, and the hot summer weather, the constant opening of the prep table covers makes the temperature difficult to maintain. Eduardo is very focused on food preparation safety. He is certified by ServSafe, a training program administered by the National Restaurant Association which offers certifications in food safety management, food handling, and alcohol service. Certification is required in 30 states, including North Carolina. Though the food truck is small, it is well organized with all of the appropriate and required stations for handling hot food, cleaning and sanitizing utensils, and hand washing. Eduardo has installed new refrigeration and has exhaust systems above the grill to exhaust the hot air. Eduardo is proud of his consistently high inspection ratings which are always in the 90-100 % range. The health inspector’s recent visit on June 19th resulted in a score of 95.5. However, on July 17th, when she returned it was at 12:30, a very busy time, with humid and hot temperatures outside, six employees working inside, and a long line of customers. Eduardo says that he was busy cooking and focused on getting through the long line of tickets when the health inspector delivered the bad news. 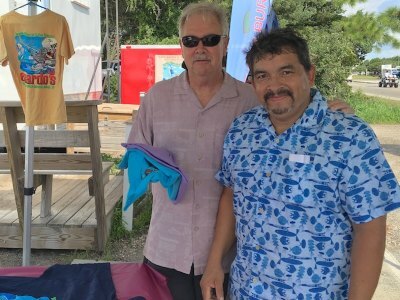 Irving Jones of Kitty Hawk, NC, a long time visitor to Ocracoke, looks through t-shirts with Eduardo. North Carolina law requires that after a poor health inspection a business must wait for at least 5 days and fix violations before having another inspection. Eduardo has added some additional ventilation and hopes that this will help to control the temperature inside the truck. He will open again on Tuesday, July 24th after the inspector gives him the approval. He says that the menu will be somewhat limited; they will not be preparing things that must be kept hot such as enchiladas and will be focusing on popular items such as tacos and burritos. Eduardo’s Taco Stand is a victim of its own success. Publicity such as its number one rating on the website Trip Advisor assures a steady stream of customers, both visitors staying on the island and day trippers, visitors who come just for the day. The stand is also very popular with island residents. With so many customers to serve, keeping the cold foods cool enough is a constant challenge. Eduardo is exploring options to avoid this problem in the future but he stresses that he always tries to do what is best for his customers. In eight years of operation, he has succeeded in providing fresh and healthy food in spite of the challenges of working from a food truck. Judging by the many comments left by disappointed customers on his Facebook page regarding the closing, patrons will be very happy to see Eduardo’s open once again.